On 1 September 2015, Central assumed Operatorship of the Mereenie Oil and Gas Field after acquiring a 50% interest from Santos in June 2015. Effective 1 January 2017 Macquarie Mereenie Pty Ltd, a subsidiary of Macquarie Group Limited, acquired Santos’ 50% interest in Mereenie and became a joint venture partner with Central. Central remains Operator. Oil and condensate are produced from the field, processed and trucked to Port Bonython for storage prior to export by tanker, normally to refineries in Singapore. Associated gas production is currently reinjected into the oil reservoir for pressure maintenance. Gas is sold to MacArthur River Mine and APA Reticulation. The Mereenie Oil and Gas Field was discovered in 1963 and commenced production in 1984, delivering hydrocarbon liquids for sale in South Australia and gas to Northern Territory markets. The Mereenie hydrocarbon accumulation is contained in an elongate 4-way-dip anticline that has a length of 40 km and width of more than 5 km. Reservoirs comprise a series of thin stacked sandstones of the Pacoota formation which have been the development focus, and in the overlying Stairway Sandstone which has produced gas in several wells where it has been tested. More than twenty separate conventional reservoir sands have been identified and correlated across the field, with typical individual net sand thicknesses of less than 5 metres within a gross hydrocarbon interval of more than 800 metres. The gas accumulation has an oil rim. The Mereenie Oil and Gas Field commenced production in 1984 and has produced over 16 MMbbls of oil and condensate and over 240 Bcf of sales gas. In 2014, production was 225,600 bbl of oil, 41,000 bbl of condensate, and 5 PJ of natural gas. The majority of wells on the field have been drilled on the flank of the Mereenie anticline to intersect reservoir sands within the oil rim. Only eight of the sixty-two wells have been located on the structural crest specifically to produce gas. Even though drilling has focused on the oil rim, the field’s production and commercial history has favoured gas production for sales. In April 2013, with oil prices over $100 per barrel, Santos committed to an extensive appraisal and development drilling program targeting oil whilst also evaluating natural gas resources. As at the end of the first quarter of 2014, Santos had completed the drilling of four oil wells, and these will be connected to existing infrastructure for production. The objective of the joint venture now is to maximise gas reserves at Mereenie and deliverability available for the proposed North East Gas Interconnector (NEGI). This will create new markets for presently discovered conventional gas and provide incentive to fully develop the field’s potential, as well as explore surrounding acreage. Exploration potential in the licence areas includes a sub-thrust play, targeting known reservoirs which could be sealed against the southern bounding fault of the Mereenie anticline. 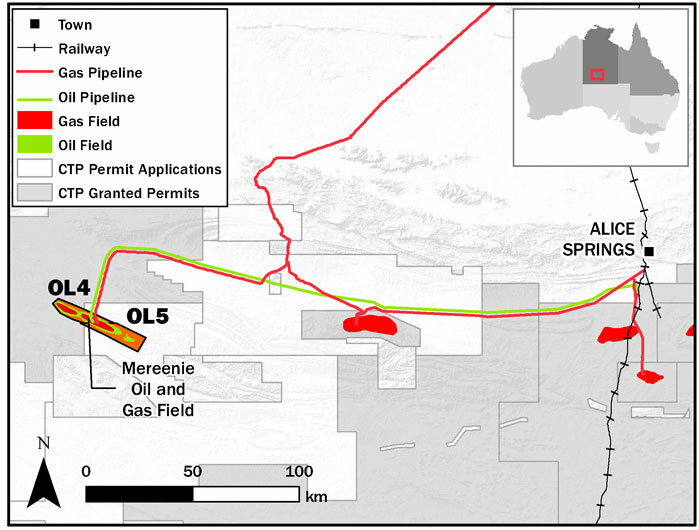 Deeper reservoirs such as the Arumbera Sandstone which is productive in Dingo Gas Field could provide a valid exploration target in the anticlinal itself. Additional work mapping the configuration of these potential traps is planned.